Solar energy production does not require fossil fuels and is therefore less dependent on this limited and expensive natural resource. With the rapid development of new, cheaper means of producing efficient photovoltaic, solar-powered devices are becoming a bigger part of our everyday lives. Roof Worx has been able to make solar power easily accessible for everyday home owners who want to lower their electricity bills with solar panels at their homes. You would love Technology Gadgets, unusual Technology Inventions and iPhone Accessories Gadgets. Most photographers use a sturdy camera strap while clicking pictures and here’s an idea that wants to capitalize on it. This is done by making the strap solar-savvy! Meaning, adding thin solar films across the width of the strap, so as to harness solar energy when out on the field. Aptly christened the Solar Camera Strap, it’s a neat idea; when we can have solar panels on backpacks and what not, then why not on a camera strap! This is another great inventions that is solar lounge Chair, it keeps Recharge Electronics gadgets while relaxing outdoors. How wonderful, if you travel on solar Powered Boat. I wish for this wonderful travelling around the world. XOFI Walk is most impressive and solar powered world fastest car powered by 893 solor cells. 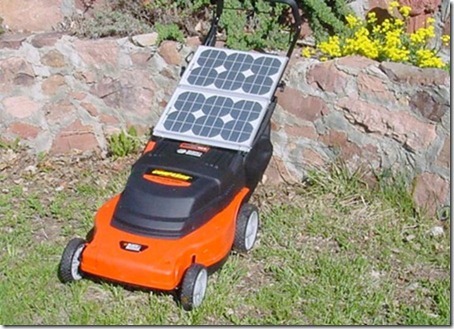 This is a really amazing and useful Lawnmower machine that clean lawn with Solar Energy powered.